In a small bowl, prepare your flax eggs by whisking 2 tablespoons of ground flaxseed together with 6 tablespoons of warm water. Set aside to thicken. In a larger bowl, whisk together the coconut sugar, oil and vanilla until combined. Add in the thickened flax eggs and mix again. Then add in the flour, cocoa powder, baking powder and salt and stir until combined. Lastly add in the shredded zucchini and mini chocolate chips and stir to incorporate everything. If mixture looks a little dry, you can add a little amount of nut milk. Pour the batter into your prepared baking dish and bake for about 20-25 minutes or until a tester inserted into the center comes out clean. 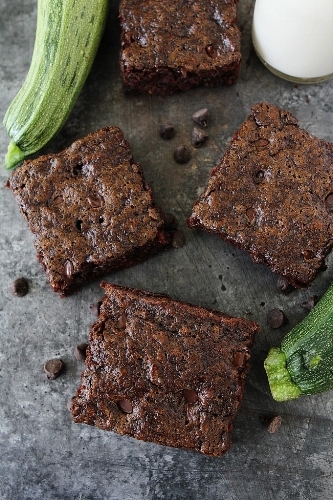 Let the brownies cool after baking, slice into squares and enjoy!